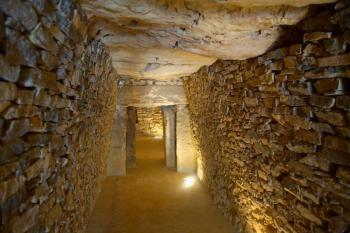 The Antequera Dolmens Site covers three megalithic monuments placed against a geomorphic natural backdrop. Because of the size, volume and weight of the stone blocks used, they are considered “one of the most important engineering and architectural works of European Prehistory”. The oldest two dolmens (Menga and Viera) date from the 3rd millennium BCE. They were made for rituals and funerary purposes. The site is located in Andalusia in Southern Spain. 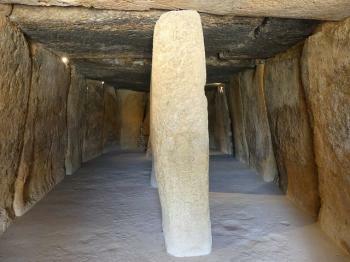 The Antequera Dolmens were the fourth prehistoric European WHS that I visited in the past 4 weeks. After the Ice Age Art Caves, Neolithic Orkney and Gorham’s Cave I was not terribly keen on checking out another one. But well, this was an orphan site that I had left ‘to tick off’ not far from Malaga Airport from where I would be flying home after the WH Travellers Meeting. So on a Sunday morning I drove out there from La Linea, in a little less than two hours. The WHS consists of 5 different features, all located in or around the mid-size Andalusian city of Antequera. Antequera comes with a few pleasant surprises. The first is that it rightly is part of our Free Entrance connection: none of the locations charge an entry fee. The sites are far from unkept though. 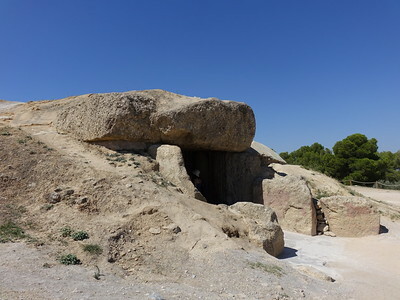 The locations of Menga/Viera dolmen, El Torcal and El Romeral are all at least manned by security and in the case of the first two they also have a small visitor center with staff, parking lots and toilets. Another positive is that one can only admire the state of conservation (or reconstruction) and the size of these megalithic structures. According to ICOMOS, the “number, size, weight and volume of stone blocks transported and assembled in the basin of Antequera, …, makes the Antequera Dolmens one of the most important engineering and architectural works of European Prehistory”. It did impress me a lot more than Neolithic Orkney for example. The Tholos of El Romeral I found the most interesting among the inscribed locations. It is the largest and most complex of the three (burial) mounds. In modern times it has ended up in an industrial estate, but Antequera's archaeological service has tried to give it some atmosphere by planting a series of cypress trees next to it and adding benches. However it attracts fewer visitors than Menga and Viera, and I had the site to myself. El Romeral is different from the others as it was a dry stone construction. It looks like a number of bricks have been put neatly on top of each other, resulting in a dome shaped chamber. The nomination file calls this “the architecture of false cupola ceilings”, or corbel domes - it results in a similar effect to an arch, the construction of which was yet unknown in prehistoric times. I know that I'm a slower traveler than most who are active on this website, but I even surprised myself how long I stayed in Antequera: it took me 3.5 hours to visit all 5 inscribed locations! That included lunch at the local McDonalds and an hour’s walk through the rocky landscape of the El Torcal nature reserve half an hour's drive away. One can even spend more time at El Torcal and do one of the longer hikes, but it's a bit of a tourist trap with lots of visiting Spanish families (whose members are not the quiet nature lover-type). WH Travellers who have visited or are planning a visit to the Antequera Dolmen might be interested in a couple of “mysteries” concerning what they saw/will see which haven’t as yet been raised in any review and, in one case, isn’t even mentioned in the Nomination file! They arose during our visit in May 18 and have been supplemented by a degree of extra investigation on my part since our return. As you climb from the visitor centre up to the Viera Dolmen you will pass a modern plaza titled the “Centro Solar de Michael Hoskin”. It contains a sun dial and a bust of said man. Born in 1930, he is an eminent British Archaeo-Astronomer, “one of the pioneers and driving forces behind Archaeo-astronomy” who has spent many years studying prehistoric sites in Europe/the Mediterranean area with reference to their astronomical orientation. This article gives an impression of the “esteem” in which he is held in Antequera and the extent to which he is credited with identifying the factors which enabled its dolmens to gain WHS status. As a point of trivia - he also has a “Minor Planet” named after him - “12223 Hoskin”! The Nomination File states - “one should note - according to studies conducted by Dr. Michael Hoskin, professor emeritus of History and Philosophy of Science at Cambridge University and one of the pioneers and driving forces of Archaeoastronomy - that over 95% of the dolmens in Europe and North Africa are orientated to the sunrise, a pattern which in the case of the Antequeran megaliths is followed only in the case of the Viera dolmen. The exceptional quality of the Antequera dolmens is that two of them - Menga and El Romeral - have an exceptional, if not anomalous, orientation.” Their “exceptionality”, according to Hoskin, is that they have a “terrestrial” rather than an “astronomical” orientation i.e Menga faces the anthropomorphic mountain of Pena de los Enamorados and El Romeral faces the highest point of El Torcal. Now, one might be a bit surprised that it required a Professor Emeritus to point this out - you just have to stand in the Menga Dolmen entrance to see that it faces the Pena (Photo)! An additional aspect of El Romeral is that it is apparently unique in not facing the rising sun at all - instead it faces West to the mountains. But I guess it needs a lot of knowledge about the domain and a lot of calculations to establish that there was no specific “Astronomic alignment” and to document the differences from normal in such matters. Prof Hoskin’s main book (“Tombs, Temples and Their Orientations – A new perspective on Mediterranean Pre-history”) is printed in its entirety in the Nomination File even though Antequera gets only 5 paragraphs in a book of 220 pages (not counting appendices)! As well as simply “facing” the Pena it is believed that the Dolmen’s centre was directed towards a particular cleft now called “Abrigo de Matacabras” where there are cave paintings. "Mystery 1". But that isn’t the end of the “orientation story” for Menga. There are a lot of misinformed claims about this on the Web – Solstices and Dolmens seem to attract a certain “kind” of interest which isn’t always concerned with accuracy! So – to pick just one site – it says “The entrance passage of Menga is 045 degrees north-east, perfectly facing the Peña de los Enamorados, making this one of the only Dolmens in Europe which faces a natural landmark.. This particular positioning is also significant because during the summer solstice, the sun shines directly above the peak of Peña de los Enamorados and bathes the Menga Dolmen's entrance passage in morning sunlight. It is believed that this would have held mystical importance for the tribes that originally built these structures.” Incorrect – the writer obviously hasn’t been paying attention or has let her enthusiasm for the subject run away with her! In fact, on the day of the solstice, the sun doesn’t rise directly behind the Pena and/or shine into the very centre of the Menga Dolmen but it DOES rise some degrees to the south and it DOES shine into a part of the Dolmen! The Nomination file has a nice picture of it doing so on Page 81 - “Image 64. View of La Peña from inside Menga dolmen illuminated by the sun of the 2007 summer solstice. Photograph: Javier Pérez González”. You can clearly see that the sun is rising SOUTH of the Pena but what DOES happen is that it is shining along one wall of the Menga Dolmen. Now Dr Hoskin didn’t mention this and neither did the Nomination File. Is it by pure chance or were the builders trying both to orientate towards the Pena AND provide for “something special” on solstice day? This article (which requires free registration to read in full), published in 2014, states that “the orientation of Menga, traditionally (has been) set to a nearby geographical feature but (is) also oriented to a certain chamber lighting during the summer solstice”. Furthermore, the article claims that the location of the stones on the left hand side on which the sun shines at the solstice is more carefully and regularly determined than the right hand side in order to achieve this effect amd contains nice drawings of how this happens! Very “clever” of those Neolithics - they wanted their dolmen to point at the Pena but they also wanted the light to shine in on the solstice as with other monuments of their culture. As the article shows, with careful design it was (would have been??) possible to achieve this ……. Are you convinced??? The Nomination File makes no mention whatsoever of these theories although the article is cited in the bibliography as the “most recent but one” article/book written on the Dolmen. "Mystery 2" - At the far end of the passage inside the Menga dolmen is a shaft which “is almost perfectly circular with a diameter of 1.5 m, to a depth of 20 m, reaching the level of the water table” (Nom File). It is covered with a grill of course! A curious aspect about it is that it received absolutely NO mention in the Video which is presented in the visitor centre, despite the fact that this included a very detailed demonstration, using CGI, of the techniques used to build the structure. Why then was the shaft's construction not shown? It turns out that it was only discovered in 2005 - which explains the rather “clunky” CGI since the video predated the discovery! Its dating and reason for construction are still matters of debate. We were told by one of the site guides that, among the infill, were Roman artefacts which indicated that the hole predated or was contemporary with that period. But why would Romans have dug it? The Nomination File however raises another possibility from a 19th C report - that it was dug during an excavation and refilled and forgotten. Despite this it concludes that “the evidence available compels us to consider the possibility that it is a prehistoric phenomenon, which would make it one of a kind, as in the whole of Europe there is no known megalithic monument with a well of these characteristics in its interior. This reinforces the claim that the design and architectonic concept of Menga are exceptional.” How likely that is or whether the claim was just trying further to “big up” the site to help its nomination – who knows? Another “mystery” about this interesting site! I visited this WHS in September 2017 en route to Ubeda and Baeza. It is only 45 minutes away from Malaga airport and for the time being is completely free of charge. The tholos' architecture is very similar to the later ones in Mycenae, Greece and is the most iconic of the lot. Its location is in the middle of an industrial estate and dump but in a way these eyesores are now guarded by an enclosure of trees which reminded me of the idyllic landscape of Val d'Orcia, Italy. Coming from Malaga, it makes sense to see this site first and afterwards head towards Antequera proper to visit the Conjunto Arqueologico Dolmenes de Antequera and the Menga and Viera Dolmens. The latter is nothing more than a stone tunnel with a broken dolmen entrance while the former is actually a burial mound or tumulus with a dolmen entrance and a supported roof (photo). It is quite similar to some of the dolmens of Malta and Gozo but only made up of one chamber and covered. From here you get a gorgeous view of olive groves and the Pena de los Enamorados which might have been considered sacred in Neolithic times. From the dolmen, the Pena de los Enamorados looks like the face of man lying down. Although I enjoyed the El Torcal nature reserve for its incredible karst formations and some birdwatching, I think there is no link to the dolmen sites. Having visited several Neolithic sites, the ones in Andalucia (and Gibraltar) are worth taking in as a side trip while visiting nearby top WHS but are definitely not worth a trip only to see them. My interest for megalithic sites was aroused during a visit to Carnac in 2015, so the inscription of the Antequera Dolmens in 2016 was perfect timing to include the site in the itinerary for our Andalusia trip in September. The Antequera Dolmens WHS comprises five sites at four locations: three dolmens and two natural landmarks closely linked to the megalithic monuments. The Dolmen de Viera and the Dolmen de Menga are located just outside Antequera on a small hill overlooking olive groves and with the view to the Pena de los Enamorados, one of the natural sites of this WHS. The visit starts in the reception centre with a short film explaining the technique that was presumably used to built the dolmens. We also learned that the landscape has significantly changed since the dolmens were built. It is believed that there were a number of lakes and ponds and forest around the tombs. Today it is the typical Andalusian landscape: dry and barren, olives seem to be the only fruit growing there. The Menga Dolmen impresses by its size, the oval interior is several metres wide and more than three metres high, you can stand upright everywhere. The side walls consist of massive stone blocks and the covering slabs are supported by three pillars. The largest stone is estimated to be 180 tons, much heavier than the largest stone in Stonehenge. Thus, it is quite obvious why the period is named "megalithic" (mega = large, lithos = stone). When you look through the entrance you see the Pena de los Enamorados, which has the shape of a lying face from this angle. And it is also the position where the sun rises during summer solstice. Visitors can witness this event, but you have to pre-book a ticket at the reception centre. The Viera Dolmen is only a few steps away and dates from the same time as the Dolmen de Menga, the age is estimated to be 5000 years. From the outside, both dolmens are about the same size, but the Viera Dolmen has a smaller interior: a long narrow passage, half of the length uncovered, leads to a small rectangular burial chamber. The Tholos of El Romeral (photo) is about 4 km away in an industrial area, you would not expect a burial place there. The site is easy to find and well signposted, it's only a few minutes by car, and the lady at the reception centre at the Menga Dolmen explained in detail how we had to drive. El Romeral is younger than the other two dolmens, it dates from about 2000 BC. A long corridor leads to a high, domed chamber and a smaller chamber behind it. The architecture is different from the Menga and Viera dolmens: the walls of the corridor and the domed chamber consist of drystone walls, large stones were used only for the covering slabs and the door frames to the chamber. The entrance is aligned to the El Torcal mountain range, the second natural landmark of this WHS, and points to its highest peak. Although the large stone blocks of the Menga Dolmen are very impressive, I liked best El Romeral because of the dome-shaped chamber and the regular structure of stone walls. The entrance to the dolmens is free, but there were only a few people around. However, this may change after inscription, Malaga and the Costa del Sol is only about 50 km away and it is expected that bus tours are organized from the popular seaside resorts. El Torcal is a spectacular karst landscape, about 10 km south of Antequera, 20 minutes by car up to the visitor center. The connection to the dolmens is established by remains of human settlement from the Neolithic period that were found in limestone caves. The nature park is very popular with tourists, no surprise, it is great fun to hike between the craggy rocks. It is a bizarre labyrinth: stone pillars and ruggy cliffs, high 'stacks' of stone slabs, that look like artificially assembled. There are two circular hiking trails starting from the visitor center: marked in yellow (about two hours) and green (one hour), the green trail is identical to the first and last sections of the yellow trail. The trails are easy, without steep sections, but rocky, so solid shoes are recommended. We took the yellow trail and enjoyed our hike a lot, but if you have little time you will get a good impression of the site when you take the shorter route. The second natural component, the Pena de los Enamorados, seems to be much harder to access. At least, there is no marked trail to the top. The A-7282 passes the mountain, but there is a railway line, a ditch and a high fence between the road and the rock. 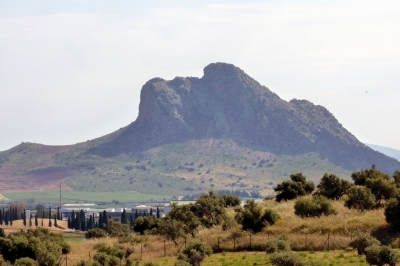 However, seen from close the mountain is not very impressive, really remarkable is the view from Antequera. There are several viewing points, eg from the Avenida de la Legion, just outside Antequera, where you have the view to the city and the Alcazar with the Pena de los Enamorados in the background. Actually, we visited the natural sites first, simply because we arrived on Monday afternoon when the dolmens are closed. So we had to stay overnight in Antequera. Certainly, most WH travellers will spend only a few hours in Antequera and visit this WHS on a detour between Granada and Sevilla or Gibraltar or on a daytrip from Granada (100 km). This is easily possible because - quite unusual for Andalusia - the opening hours are from 9 am to 6.30 pm (closed on Mondays) without a siesta break. All in all, Antequera was a worthwhile stopover on our Andalusia trip, the WHS is a nice combination of megalithic monuments and natural landscapes. 4.5: Xiong Wei Antonio J.
Monumental Monoliths: Menga "was built with thirty-two megaliths, the largest weighing about 180 tonnes (200 tons)" (Wiki). Controversial museum plans: Antequera Museum Plans were modified to reduce visual impact on panoramic view of Pena dos Enamorados from Menga Dolmen. Built in the 3rd Millennium BC: The oldest two dolmens (Menga and Viera) date from the 3rd millennium BCE.